The council in the Melbourne suburb of Moreland became the third in Victoria state to decide not to recognise Australia Day. The annual holiday, on January 26, commemorates the arrival of the country’s first British settlers in 1788 and is a time when citizenship ceremonies are held. But it is termed ‘Invasion Day’ by many indigenous Australians who say it marks the beginning of the decline of Aboriginal culture. How tragic it is to decline from the lofty heights of Stone Age savagery. In debating the issue Wednesday, Moreland Socialist Alliance councillor Sue Bolton said commemorating Australia Day ‘would be like celebrating the Nazi Holocaust’, state broadcaster ABC reported. It’s getting so just being Caucasian is kind of like celebrating the Nazi Holocaust. Next on the P.C. chopping block: the Fourth of July. Heritage is racist; it will be erased, not celebrated. 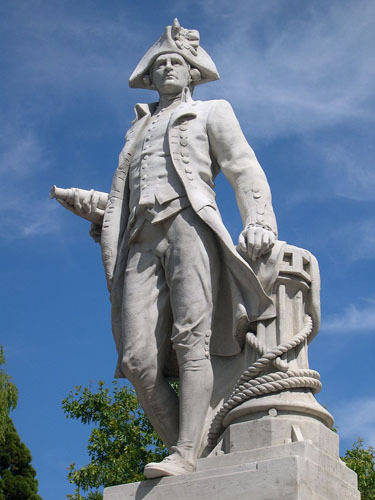 Australia’s discoverer James Cook: another racist to be erased. On a tip from Steve T. Cross-posted at Moonbattery.